In two previous posts, I examined the New York Times’ (NYT) use of racial labels for African Americans and Latin@s (Latinos or Latinas) using NYT Labs’ tool, Chronicle. I found that the NYT has changed the labels they’ve used for these groups over time and also gone through periods of more or less intense discussion of African Americans and Latin@s. One lingering question that I have is how the NYT’s discussion of these groups compares to their discussion of the dominant racial group in the US: White/European Americans. This question is a difficult one because it involves the comparison of things that are not easily comparable. Like the other racial categories, the racial category of “Whites” is a social construct. That is, it has been created using arbitrary criteria and perpetuated within society. It appears to many people to be natural and because of this has real world consequences that privilege Whites while marginalizing people of color. However, unlike categories established for people of color (such as African Americans and Latin@s), which are treated as marked in society, many commentators have noted that Whiteness is not readily remarked upon. It is treated as if it were ‘the norm’ and thus not worth mentioning. In this way, many distinguish between people of color who ‘have race’ and White people who are treated as if they do not. This has consequences for using Chronicle to examine the discourse of the NYT, because if Whiteness is unmarked, then we would expect to see it go unmentioned in public discourse. In other words, we would expect not to see the NYT mentioning Whites (that is the term Whites) very frequently while still discussing people, perspectives, and issues that are decidedly White. Statistics for each of these are presented in the table below. What is most interesting to me is to think about how these terms are used in comparison to terms for African Americans (for example, Blacks) and Latin@s (for example, Hispanics). The plot below charts the sum of frequencies of various terms for Blacks (the terms discussed in part 1), Hispanics (the terms discussed in part 2, and I added Hispanic people), and Whites (the terms above). We might ask ourselves “Why is this a worthwhile observation?” especially considering that terms for Whites are apparently more frequent than terms for another group, Hispanics. The tendency to be less commonly referenced by the NYT than Blacks could be seen as odd given Whites’ status as the dominant racial group in the United States both in terms of population and political and economic power. Given that there’s no shortage of White people featured in the NYT, the most plausible explanation seems to be that they simply are not racialized (in other words, their race is not made relevant or they are not identified by their race). It is interesting also to note that the mention of Whites using terms that explicitly name Whiteness tends to rise and fall along with the mention of Blacks. 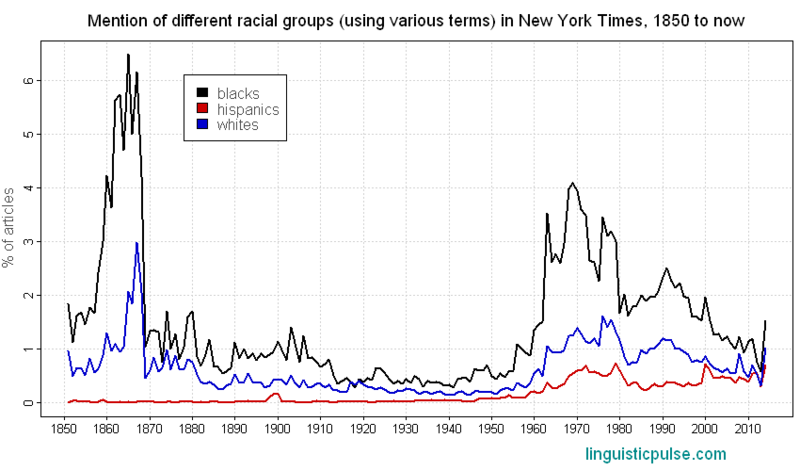 In other words, in years when the NYT wrote more frequently about Blacks, they also tended to write more about Whites using terms for Whiteness. It appears then that language that explicitly racializes Whites appears in conjunction with language already explicitly racializing Blacks or other groups. Whiteness it appears is not frequently commented on by NYT writers in the absence of other racial groups. However, the NYT’s more frequent mention of Blacks suggests that articles that focus primarily on Blacks without naming Whites as a racial group must be prevalent, and indeed they are. Many of these are reports of anti-Black racism in various forms such as threats of violence or discrimination in education, employment, or policing (for example, a 1994 article titled “Immigration Service Faces a Bias Suit by 550 Blacks”). Many more look at Black groups with racial justice aims like the NAACP. A smaller number speak of the gains that Blacks have made in recent decades in various arenas: industry, education, and so on (for example, a 1991 article titled “Black Writers Gain Audiences And Visibility in Publishing”). I think it’s interesting to ask why Whites as a group or as individuals are not frequently explicitly racialized in the NYT and elsewhere, despite obviously playing some role in events reported in the NYT as having to do with Blacks. It could be that the absence of a racial label in such a context is automatically interpreted by many readers as meaning the person is White, which is certainly in line with what I’ve said above. However, I’m left pondering the following questions: What effects might this have on the way we interpret events thought to be connected to race? To what extent, does silence about Whiteness make us less cognizant of racism?